The following was written January 2006, by Diana K. Gibson, a teacher at the Ridgewood Art Institute. Arthur F. Maynard, a student of Frank Vincent DuMond, was an immensely talented artist and an inspirational teacher. He taught painting for over 40 years, and is considered by many the beloved patriarch of the Ridgewood Art Institute in New Jersey. He held degrees from Princeton and Harvard, served in the Navy in World War II, and studied at the Art Students League with Frank Vincent DuMond for eight years. Maynard received numerous awards, including the DuMond Memorial Award from the Hudson Valley Art Association, but eventually stopped exhibiting because he did not want to compete with his students. Maynard was profoundly influenced by Frank Vincent DuMond. 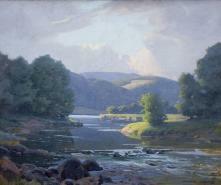 Like DuMond, he had a great interest in the principles of light and its effects on the landscape. He is remembered by his students as teaching the “why” rather than the “how” of painting. Why the light illuminating an object appears as it does, according to a basic set of principles determined by distance, atmospheric conditions, the time of day and the nature of the object’s reflective surface was of great interest to him. Maynard followed in the footsteps of his predecessor, becoming an instructor at the Art Students League for a few years before founding the Ridgewood Art Institute. For 41 years until his death in 1991, Maynard was the most influential force behind the Ridgewood Art Institute. Throughout the Ridgewood Art Institute’s many years in existence, many of Arthur Maynard’s students have become noted painters and educators; and some have been said to rival his artistic and educational achievements. Second-generation Maynard students in turn have benefited from the DuMond teaching precepts and methods, becoming painters and educators in their own right.